Bak Chor Mee Is One Of My Favourite Foods. | Curious Foodie. « A Singaporean ‘Zhi Cha’ (煮炒)Dinner. Bak Chor Mee Is One Of My Favourite Foods. 😀 This time, I remembered to take a photo. 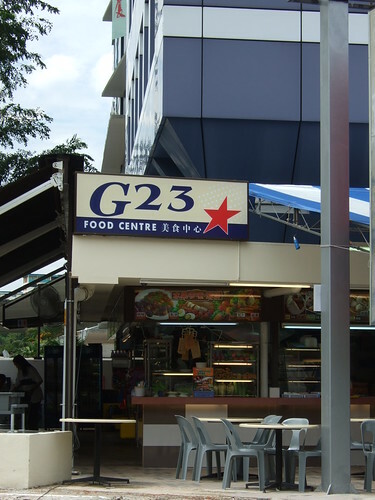 While I was on a site visit today, I decided to eat my lunch at G23 Food Centre (Fansida Building) located near Aljunied MRT (the local train service). It is about a five minute walk away from the MRT. This is how a typical hawker centre in Singapore would look like. I ordered a bowl of Bak Chor Mee from “Ali Shan Noodle House”. I did not manage to take a photo as I was too hungry to remember. 😉 I rate the noodles a 1.6 over 5 stars. For me, there was too much ketchup and the lack of flavour from the chilli. There was too much lard and there were no meatballs! Meatballs are the main reason for me when it comes to eating Bak Chor Mee, I was therefore very disappointed. 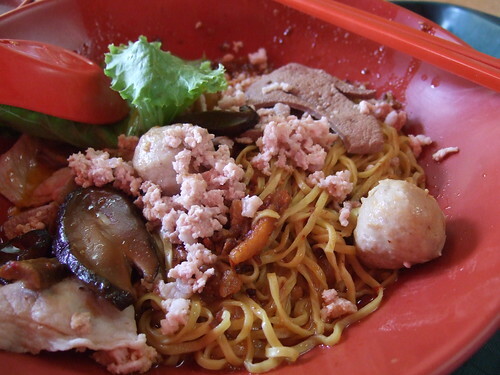 If you really want some good Bak Chor Mee, take a look at this list. I will be tracking them down real soon. 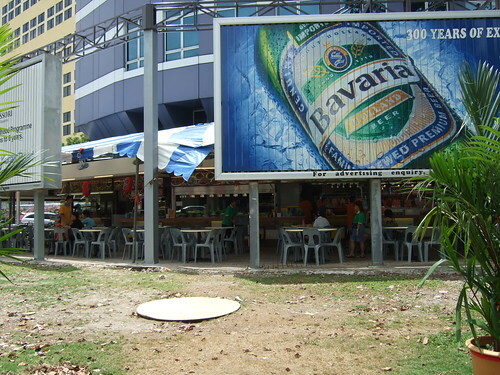 This entry was posted on March 20, 2008 at 2:47 pm and is filed under Food in Singapore, Restaurants. You can follow any responses to this entry through the RSS 2.0 feed. You can leave a response, or trackback from your own site. Personally, I don’t really agree with that list. I have some doubts about it. I am not keen into franchised outlets like Chai Chee, they are ok but I feel there’s a lack of heart. The Bedok Blk 85 ones are alright, they do it in a soupy manner which is really hearty. You seem to eat out a lot, is eat out food cheap in Singapore? Most of it looks scrumptious! If I ever get rich, I’m coming to Singapore and I will hire you for a week to guide me round the best places to eat:) Singapore is one of the few places in the world I’ve never been, you make it look like great fun. brendanstallard: I have a balance of eating out and having homecooked food, I’m a very blessed girl. 😀 Food in Singapore is very affordable. For example, the average price of a bowl of Bak Chor Mee would be S$4 – which is pretty all right. Do visit Singapore soon, its got great people and great food! 🙂 If you do decide to come, drop me an email and I’ll suggest some of the best places for you to eat. Cheers!